Find out how OCU will affect your Shopify's Orders & Reports. The OCU app uses its own checkout system for any carts that have an OCU trigger product added. Since it uses its own checkout, it does affect some of the Reports in Shopify which are based solely on Shopify's checkout. The orders processed and imported by OCU will be under the "Other" sales channel in the Home section of Shopify admin. 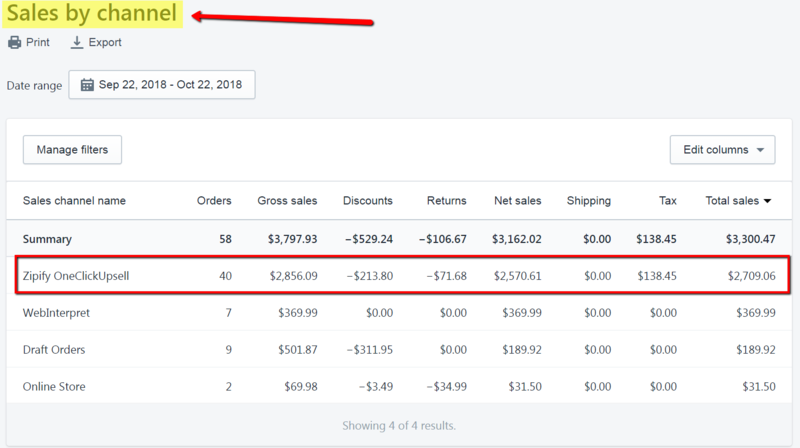 They will also be listed under the "Zipify OneClickUpsell" channel in the Analytics section of your Shopify admin rather than the "Online Store" channel that standard Shopify orders fall under. This particularly affects the "conversion rate" statistic which is based solely on the "Online Store" sales channel. Unfortunately, we are not able to have the OCU orders fall under the "Online Store" sales channel, so it does skew that stat. However, it's not an accurate representation of what is actually happening sales-wise on your store. We recommend using the built-in Statistics section as well as the Facebook Pixel ID and Google Analytics integrations within the OCU app for tracking conversions, conversion rates and other important data about what is happening on the OCU checkout on your store. You can also add a different tag by removing this filter and then filtering by the tag, "Zipify OCU Order with offers" and click "add filter". This will pull up any orders imported by Zipify OCU that have an upsell/downsell offer taken. That includes any orders that have accepted either an upsell, a downsell or both. For the Shopify and Advanced Shopify plans that have the "Analytics" section enabled, you can access the Analytics section for further statistics and information. For example, in the above screenshot you can see that the "Stripe Connect" payment method was used for the "Zipify OneClickUpsell" sales channel to process 30 transactions in that time period. The report will also show statistics for gross payments, refunds and net payments. By going to Analytics > Reports > Behavior > "Website cart analysis" you can view a report that gives useful information on the "add to cart" behavior of your customers. It will take information from the last 30 days and display the insights there.